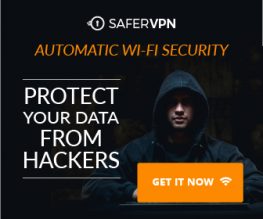 As you may know, Shadowsocks is a free and open-source Socks5 proxy that can be used to bypass Internet firewall or filtering system. We already covered how to install Shadowsocks python version on Debian, Ubuntu and CentOS server. That’s probably the easiest way to get started with this proxy software. But did you know that there’s also another software called Shadowsocks-libev? Shadowsocks-libev, on the other hand, is written in C programming language and thus it consumes little RAM and is a very good fit for low-end device such as routers. The latest stable version is v2.4.8 which was released on July 20, 2016. In order to use Shadowsock-libev to bypass firewall and filtering systems, you need to install the server software on your server and install the client software on your local machine. Then you tell your Firefox or Google Chrome browser to use the proxy. That’s all you need to do. Yes, we can install shadowsocks-libev from repository. However you are not likely to get the latest stable version. Here’s how to compile the latest version from source. 1. SSH into your Ubuntu 16.04 server and install git version control tool. 2. Clone the source repository from Github. 4. Configure build environment and compile it. Before we can start the shadowsock-libev service, we need to configure the socket, password, encryption method and thing like that. So execute the following command to create a configuration file. server: your hostname or server IP. method: Available encryption method are, “bf-cfb”, “aes-256-cfb”, “des-cfb”, “rc4”, etc. Default is table, which is not secure. “aes-256-cfb” is recommended. To let it automatically start when Ubuntu 16.04 server is booted, we can put this command into /etc/rc.local file. Add the ss-server command above exit 0. Save and close the file. Follow the same steps to compile and install shadowsocks-libev on your local Ubuntu 16.04 machine. Next create the same configuration file. The shadowsocks-libev client software is ss-local. So enter the following command to start it, provided that the configuration file is created. And of course, we can also put this command in /etc/rc.local file so that the client will automatically start when Ubuntu 16.04 is booted. It’s interesting to see that ss-server and ss-local don’t require sudo privilege. Fire up Firefox. In the menu bar, choose Edit > Preferences. And then click the Advanced tab. choose network and then settings. 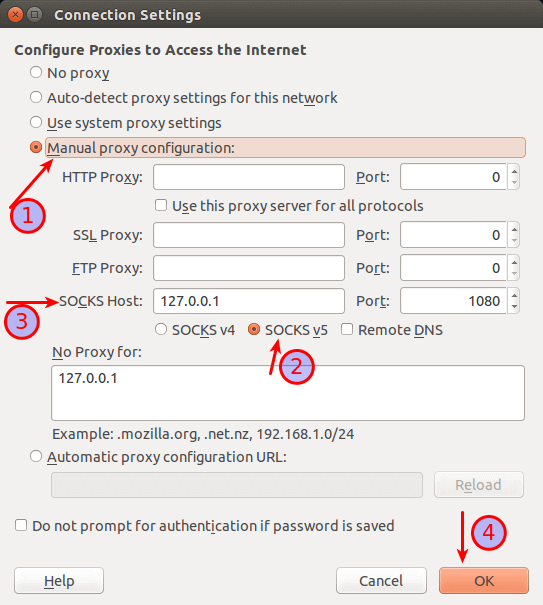 In the connection settings window, select manual proxy configuration and on the socks host field enter 127.0.0.1, enter 1080 in the port field. That’s because in the shadowsocks-libev configuration file, we set 127.0.0.1 as the local host and 1080 as the local port. Be sure to choose socks v5 as the socks type and check Remote DNS. Finally click the OK button. Some programs don’t support Sock5 proxy. Fortunately you can use proxychains to redirect any program to go through your proxy server. As always, if you found this post useful, subscribe to our free newsletter or follow us on Google+, Twitter or like our Facebook page.